Not all villains are created equal; for every Magneto, Juggernaut and Apocalypse there’s these guys. 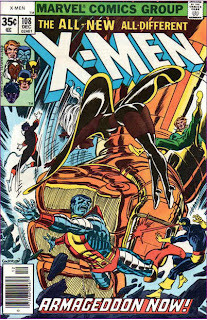 I will do my best to avoid populating this list with villains from the X-Men’s less-than-illustrious late 60s run (I could probably fill several such lists with the likes of Grotesk, the Colbalt Man and Factor Three). 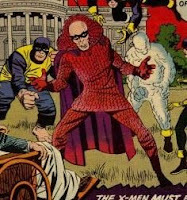 Toad: First appearing as Magneto’s, well, toady in the Brotherhood of Evil Mutants, Mortimer Toynbee jumped the around the 60s in a jester suit, lusting after the Scarlet Witch. He tried to make it big in the 90s, leading his own incarnation of the Brotherhood, but it wasn’t too long before he was back to his simpering ways. Also, he recently experienced a secondary mutation that made him look more like Ray Park. 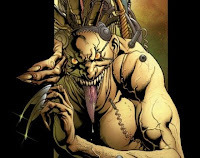 Mojo: The aforementioned ruler of the Mojoverse, Mojo belongs to a race of beings that lack a spine and rules his world by dominating the ratings, which he receives by broadcasting the X-Men’s adventures. He’s a villain that in no way, shape or form is thematically relevant to anything the X-Men are about, but at the same time, I enjoy a good Mojo story from time to time. There’s just something about how completely ill-fitting he is that is endearing. The Vanisher: Teleportation doesn’t seem like a lame power, though it really isn’t that offensive of a power, but it certainly isn’t equivalent to the godlike omnipotence the Vanisher seems to think it grants him. Also, check out that costume. It’s no wonder this guy never made it to A-List status. Count Nefaria: A leading member of the Maggia (Marvel’s mafia), Count Nefaria used an assortment of henchman (like the Ani-Men) to carry out his schemes before receiving his own super-powers. But his greatest accomplishment against the X-Men came in his suit-and-monocle days, when he managed to kill Thunderbird. The fact that Thunderbird is one of the few X-Men to actually stay dead helps put Nefaria in a fairly exclusive club. Blob: Fred J. Dukes possesses the one mutant power each and every one of us could one day possess: he’s really, really fat. Also, in his first appearance, before joining Mystique’s Brotherhood of Evil Mutants, Blob was a side show attraction that led his co-workers in an attack on Xavier’s school. That’s right, Blob’s a carnie, a King among Men.